ICMR Scientific (Medical and Non-Medical) Recruitment Notification 2018: Apply for 42 scientific (medical and non-medical) vacancies @ icmr.nic.in. 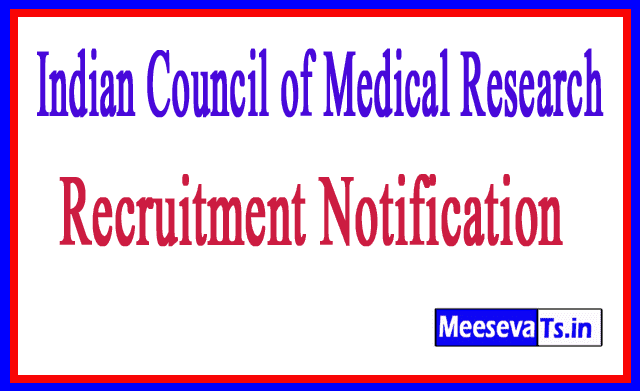 Indian Council of Medical Research ICMR (medical and non-medical) recruitment is going to recruit scientists (medical and non-medical) through 2018. Interested and qualified candidates who want to apply this recruitment, can apply offline on their official website icmr.nic.in. The full details of this recruitment are available on their official website and meesevats.in also provides complete information about this notification. Educational qualification, application process instructions are outlined below for implementation. According to individual discussion, publication, research experience, awards, fellowship, personal discussion, etc. will be performed accordingly. Demand Draft in favor of DG, ICMR, New Delhi, wherever applicable. Interested and qualified candidate can download the website from icmr.nic.in in prescribed form and send your application on or before 07.12.2018. The prescribed format with photocopy of all relevant documents should be submitted to the address specified below. Assistant Director General (A), Indian Medical Research Council, V. Ramalingaswamy Bhavan, Ansari Nagar, Post Box. No. 4911, New Delhi - 110029.